Make a statement with this exquisite Godiva gift hamper featuring the new limited-edition Wonderful City Dreams, along with a tempting collection of Godiva favorites. 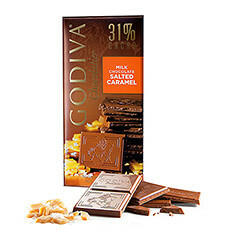 The assortment of filled pralines, chocolate hearts, truffles, and more will delight your family and friends. The centerpiece of this gift is the Wonderful City Dreams gift box with a world of taste sensations. 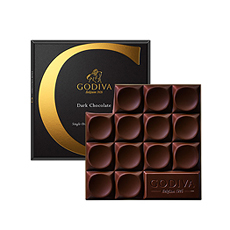 Five Chef Chocolatiers have reinterpreted Godiva classics with a sophisticated twist that is like a journey from city to city in delicious style. 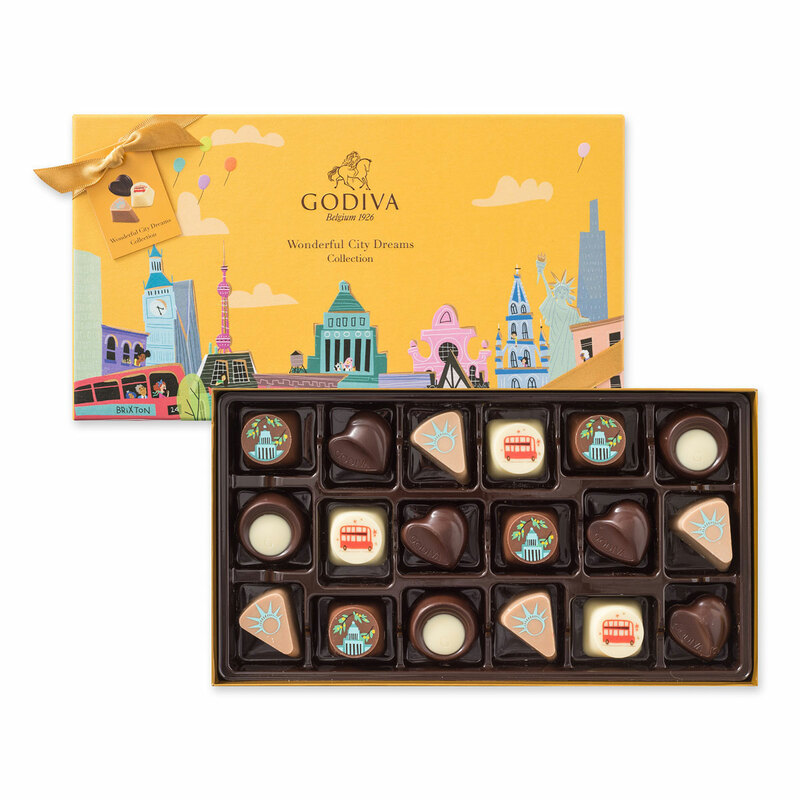 Flavors include New York Cheesecake, London Fraise Violette, Shanghai Lychee, Tokyo Yuzu Orange, and Milk Chocolate Hazelnut Heart. 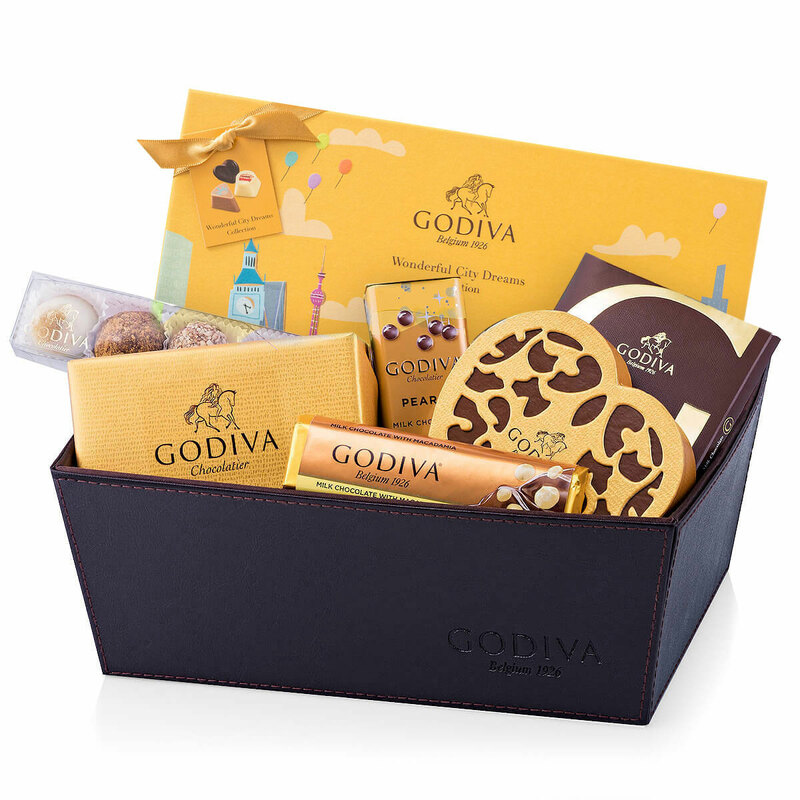 The gift hamper also includes the traditional Godiva classics that everybody loves. 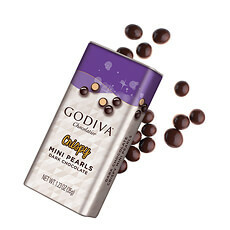 The Gold Ballotin offers an assortment of carefully selected filled pralines to suit every taste. 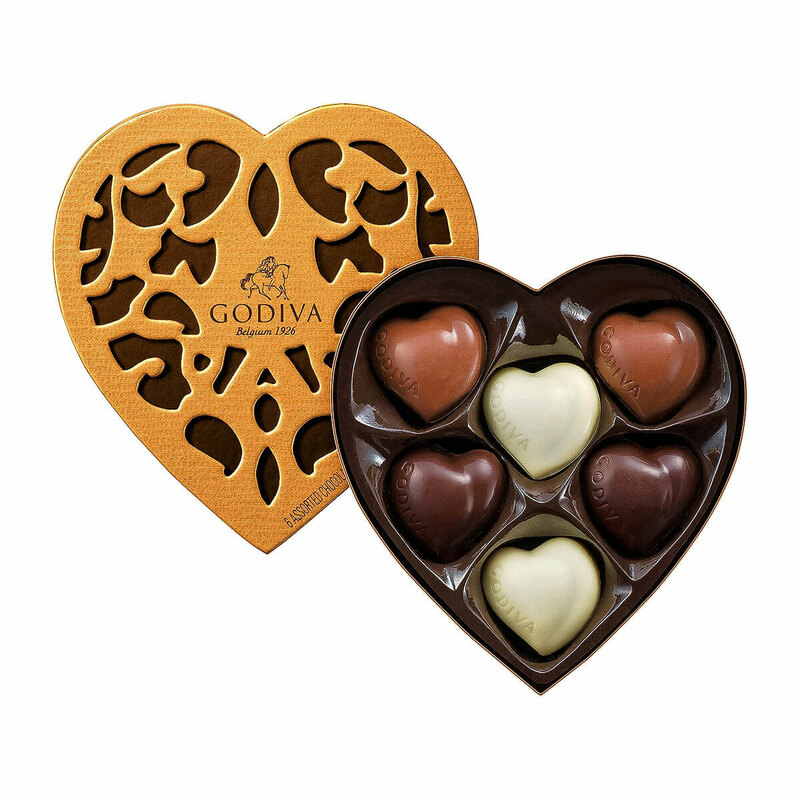 The Coeur Iconique is a beautiful heart-shaped filigree gift box holding six milk, dark, and white chocolate hearts. 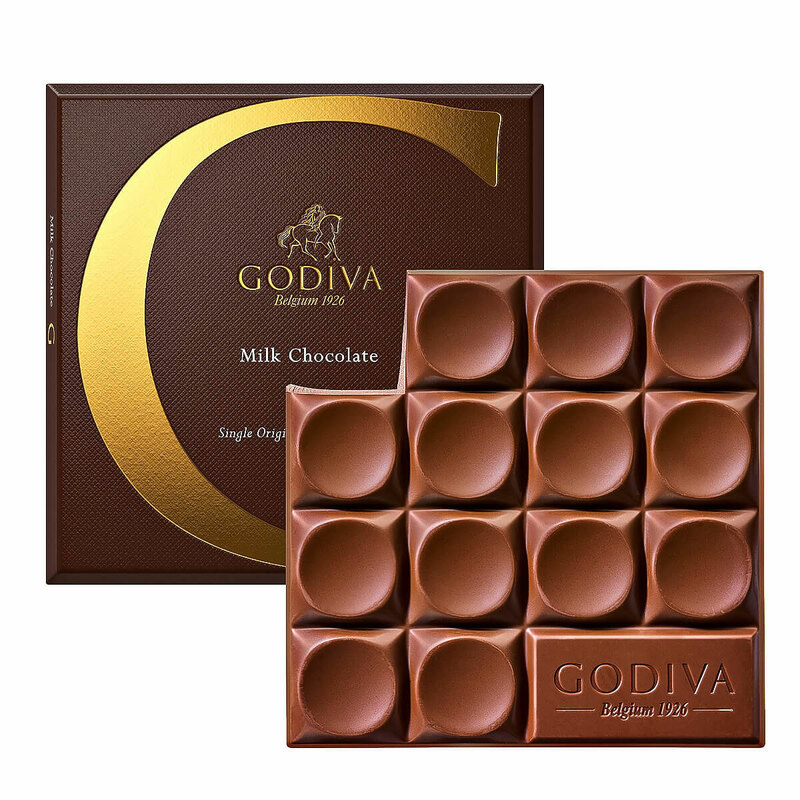 Even more Godiva pleasures await in this wonderful gift, including a flight of six dreamy chocolate truffles, a milk chocolate tablet, and milk chocolate Pearls. 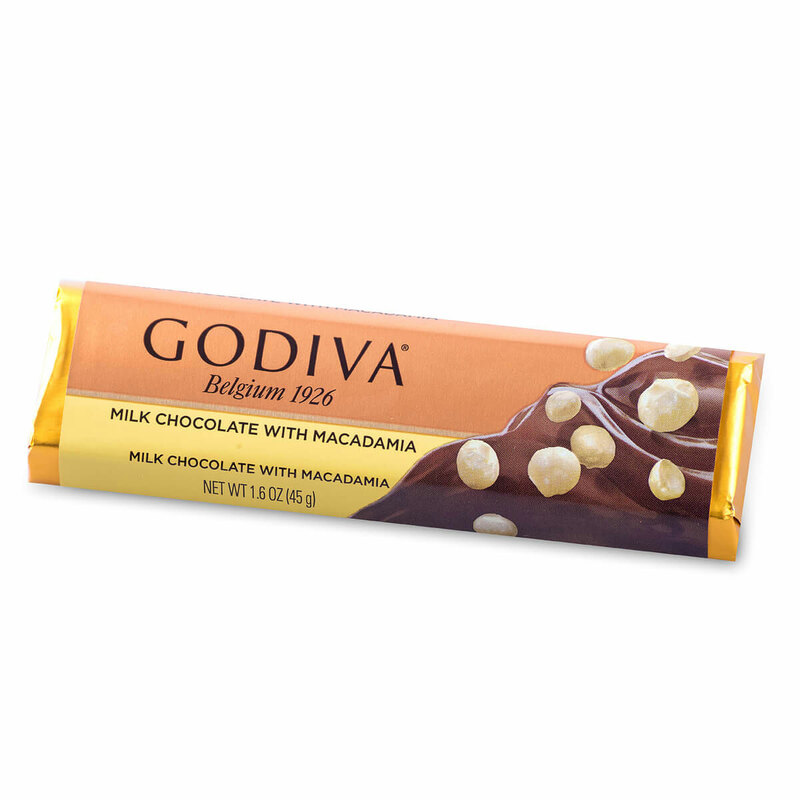 Whatever the occasion, this is a must-have gift for all Godiva fans. Ingredients: Sugar, cocoa butter, cocoa mass, full cream milk powder, cream, vegetable oil (palm, palm kernel), humectants (sorbitol syrup, glycerol), glucose syrup, skimmed milk powder, hazelnuts, butter, butter oil, orange juice concentrate, strawberry juice concentrate, invert sugar srup, wheat flour, grapefruit, flavourings, emulsifier (soy lecithin), maltodextrin, pecan nuts, strawberries, lychee, inulin, acidity regulator (citric acid), salt, vegetable fat (palm, shea nut), starch, colours (E171, E129*, E102*, E133), honey, cocoa powder, natural vanilla. *E102, E129: May have an adverse effect on the activity and attention of children. Allergy Advice: Contains milk and milk products, tree nuts and its derivatives, gluten and soy and its products. Ingredients: Sugar, cocoa mass, full cream milk powder, cocoa butter, hazelnuts, almonds, butter oil, cream, humectant (sorbitol), glucose syrup, vegetable oil (palm kernel, palm), butter, invert sugar syrup, emulsifier (soy lecithin), cocoa powder, skimmed milk powder, wheat flour, flavourings, passion fruit juice concentrate, full cream milk, salt, wheat starch, milk sugar, milk protein, barley malt flour, natural vanilla, acidity regulator (citric acid). Allergy Advice: May contain milk products, nuts, soya and gluten. Ingredients: sugar, cocoa mass, full cream milk powder, cocoa butter, hazelnuts, butteroil, cream, humectant (sorbitol), invert sugar syrup, skimmed milk powder, cocoa powder, glucose syrup, emulsifier (soy lecithin), natural vanilla flavouring, vegetable oil (palm, palm kernel), butter, natural vanilla. Allergy Advice: May contain wheat (gluten). Nutrition Declaration per 100g: energy 2192 kJ/524 kcal - total fat 32g - saturates 17g - carbohydrate 51g - sugars 48g - protein 7g - salt 0,12g. Ingredients: Sugar, cocoa mass, full cream milk powder, cocoa butter, vegetable oil (palm kernel, palm, sunflower, rapeseed), almonds, wheat flour, butter oil, glucose-fructose syrup, cocoa powder, cream, invert sugar syrup, hazelnut, sweetened condensed milk, skimmed milk powder, rice flour, humectant (sorbitol), butter, glucose syrup, flavourings, emulsifier (soy lecithin), strawberry, salt, dried strawberries, maltodextrin, soy flour, cinnamon, milk sugar, milk protein, wheat starch, barley malt flour. Ingredients: Sugar, cocoa mass, cocoa butter, whole milk powder, skimmed milk powder, natural vanilla flavouring, emulsifier (soy lecithin). Allergy Advice: Contains milk and soy. May contain nuts and wheat (gluten). 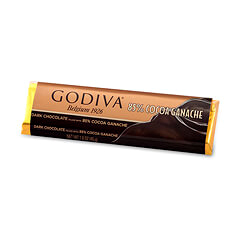 Ingredients: Sugar, full cream milk powder, cocoa butter, cocoa mass, shellac, emulsifier (soya lecithin), vanilla. Ingredients: Sugar, full cream milk powder, cocoa butter, cocoa mass, emulsifier (soy lecithin), macadamia nuts, natural vanilla flavouring. Allergy Advice: May contain tree nuts and wheat (gluten).